Modern humans first arrived in the Iberian Peninsula around 35,000 years ago. 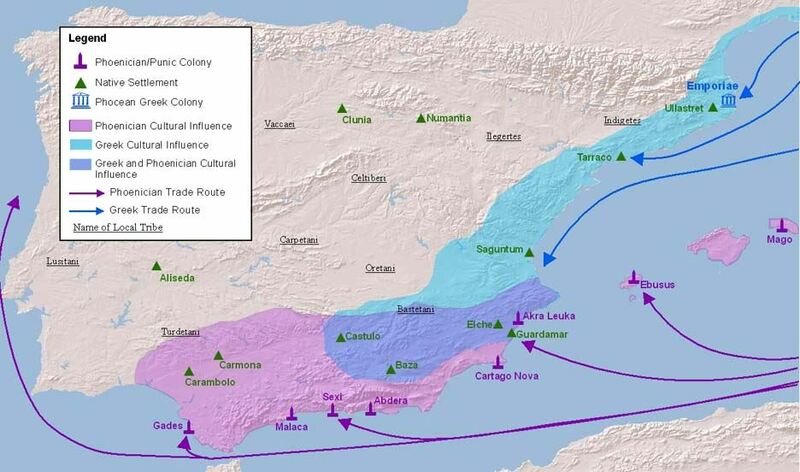 Iberian cultures along with ancient Phoenician, Greek, Celtic and Carthaginian settlements developed on the peninsula.It was mainly colonized by the city of Phocaea and related colonies, such as Alalia and Massalia in Gaul. Notable poleis established here were Emporion and Rhode. Colonies in Spain were less typically Greek in culture than those in other areas of the Mediterranean, competition with the Phoenicians was fierce, and the region seems always to have been considered a distant and remote land by mainland Greeks. It came under Roman rule around 200 BC.